The INREV NAV module provides guidance on calculating this standardised measure of a vehicle’s net asset value, which aims to give an accurate reflection of its economic value. This NAV figure is based on the fair value of the underlying assets and liabilities on the balance sheet date. It is adjusted to reflect the spreading of costs and ensures consistency between vehicle reporting and valuation, as well as allowing investments to be compared across borders. The module explains how to calculate the INREV NAV from different local GAAPs and IFRS, using explanations and examples to help you make these adjustments. The committee aim to improve the consistency and presentation of information and encourage greater transparency in reporting to investors and the market in general. Difficulties in comparing performance led to the development of INREV NAV. This beginners guide explains how it works. Jef Holland, Deloitte, presents the INREV NAV module, including background information, adjustments, computation, disclosure requirements and Q&A. "In order to foster a consistent and transparent approach to valuing funds, INREV has developed a set of guidelines for calculating and adjusting NAV"
Assess your compliance with the INREV NAV methodology. The Standard Data Delivery Sheet (SDDS) is a template to disclose financial information, including the INREV NAV. An example INREV NAV Computation is available for download. INREV’s objective in establishing these guidelines is to provide managers with guidance on how to calculate and disclose an INREV NAV in financial reports of non-listed European real estate vehicles. This should lead to transparency and comparability of the performance of different types of vehicle and will enable investors to understand the information provided. One of the purposes of reporting is to present investors with information relevant to the performance and valuation of their investment. The NAV derived from generally accepted accounting principles (GAAP), including IFRS, does not necessarily fulfil this objective. This guidance has therefore been prepared to provide an industry specific framework to enable managers to calculate a more meaningful adjusted NAV. Both investors and managers seek an approach that is consistent across the real estate industry. The application of different accounting standards has also led to inconsistency of calculation of an adjusted NAV. Investors and managers also want to be able to compare the performance and valuation of non-listed European real estate vehicles against other vehicles. 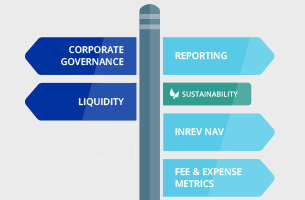 INREV NAV should reflect a more accurate economic value of the investment (units) based on the fair value of the underlying assets and liabilities, as at the balance sheet date, as adjusted for the spreading of costs that will benefit different generations of investors, as compared to a NAV based on generally accepted accounting principles. The main aim of the NAV is to compare vehicle performance across a peer group and for the valuation of the investment in the units for accounting purposes at the investor level. It is not intended to be a measure of the net realisable value of the vehicle units at the balance sheet date, which might be impacted by a wide range of other factors. The principles and guidelines of how INREV NAV is determined are listed below. Where appropriate, further explanation is provided to assist your understanding. In addition, a tools and examples section includes a sample INREV NAV calculation containing many of the common adjustments that are required to derive an INREV NAV from financial statements prepared under IFRS. Finally a series of questions and answers has been added to provide further assistance with common queries. The INREV NAV guidelines override the accounting principles by making adjustments to the results arrived at by following the chosen GAAP. INREV NAV adjustments require material judgment by the manager (e.g., deferred tax, transfer taxes). Consequently, it is important to include sufficient disclosures to allow investors to understand positions taken by the manager. INREV NAV should reflect a more accurate economic value of the investment (units) based on the fair value of the underlying assets and liabilities, as at the balance sheet date, as adjusted for the spreading of costs that will benefit different generations of investors, than the NAV based on generally accepted accounting principles. The fund documentation should include details of valuation rules and procedures, pricing methodology including the methods used in valuing hard-to-value assets, and the frequency of valuation for all material assets and liabilities of the vehicle. The fund documentation should disclose the frequency of the NAV calculation. The INREV NAV best practice requirements for the calculation of an adjusted NAV should be used for both open end and closed end vehicles. In this section direct links will be made to IFRS as a basis for calculating the required adjustments and, if needed, to other fair value concepts. If another basis of GAAP is used, further adjustments may be required to align with IFRS as the basis for determining an INREV NAV. References to further guidance by INREV on the interpretation of fair value and provision accounting will also be included. Investors’ capital can take various forms aside from equity – examples include shareholder loans and hybrid capital instruments such as convertible bonds. Some vehicles are structured via a combination of equity participations and shareholder loans. Shareholder loans and hybrid capital instruments are generally seen as part of the investors’ overall interest in the vehicle. They should be included as a component of equity in the INREV NAV and reclassified as such if they have been classified as liabilities in the financial statements of the vehicle under IFRS. The amount to be reclassified should reflect the corresponding carrying value of the liabilities in the IFRS accounts. The existence of such instruments as part of the capital structure of a vehicle at its origination, or investor loans that are pari-passu to their equity stake and at off-market loan terms, are indicators, among others, that these items should be reclassified as part of the INREV NAV. The reclassification should also take account of accrued interest, which is treated in a similar fashion to dividends. Under certain circumstances dividends are recorded as a liability but have not yet been legally distributed. For the determination of INREV NAV, these accrued dividends should be reversed to the NAV. If a real estate vehicle uses the option to account for investment properties under the cost model, this adjustment represents the impact on NAV of the revaluation of the investment property to fair value under the fair value option of IAS 40. The effect of straight-lining of lease incentives, rent guarantees, insurance claims (for damages, lost rent, etc.) should be taken into account when valuing the property at fair value in accordance with IAS 40 and SIC 15 to ensure that any asset is not double-counted in the NAV. If a real estate vehicle uses the option to account for self-constructed or developed investment property under the cost model, the adjustment represents the impact on NAV of the revaluation of the self-constructed or developed investment property to fair value under the fair value option of IAS 40. Some investment properties may be classified as assets held for sale or as a group of assets held for sale. The carrying value of such investment properties depends on the chosen accounting treatment under IAS 40 (either fair value or cost). The adjustment represents the impact on NAV of the revaluation of the investment property intended for sale, measured at fair value or cost, to the net realisable value (fair value less disposal costs). Property that is leased to tenants under a finance lease is initially measured on a net investment basis and subsequently re-measured based on an amortisation pattern reflecting a constant rate of return. The adjustment represents the impact on NAV of the revaluation of the finance lease receivable to fair value. Properties intended for sale and accounted for under IAS 2 (Inventory) are measured at the lower of cost or net realisable value in the financial statements. This adjustment represents the impact on the NAV of the revaluation of such properties to net realisable value (fair value less disposal costs). This adjustment should be included under the caption ‘revaluation to fair value of real estate held as inventory’. Where the likely disposal date is more than one year from the date of the NAV computation, disposal costs should not be deducted from fair value in calculating this adjustment. Under IAS16 other investments in real assets are normally accounted for at cost. The adjustment represents the impact on NAV of the revaluation of other investments in real assets to fair value in accordance with the fair value assumptions under IFRS 13. Financial assets and liabilities such as hedging instruments or debt obligations are generally measured at amortised cost, taking into account any impairment when applicable. The adjustment represents the impact on NAV of the revaluation of financial assets and financial liabilities to fair value as determined in accordance with IFRS, if not yet accounted for at fair value. In addition, vehicles may incur costs for redemption of bank debts as a result of sales of properties. As with disposal costs, these costs are generally not accrued in IFRS. Where the disposal of a property is expected within one year, and therefore, the redemption of the related bank debt is also expected within one year, any bank debt early redemption costs should be accrued in the NAV. Under IAS11, construction contracts for third parties are normally accounted for based on the stage of completion. The adjustment represents the impact on NAV of the revaluation of construction contracts for third parties to fair value in accordance with the fair value principles of IFRS 13. As described in further detail below, set-up costs and acquisition expenses should be capitalised and amortised. The rationale for these adjustments is to spread these costs over a defined period of time to smooth the effect of the write-off of costs on the vehicle’s performance. Furthermore, it is a simple mechanism to spread costs between different investor groups entering or leaving the vehicle’s equity at different times. In practice, there are many other ways in which vehicles address such issues for pricing, valuation, or other purposes including using bid-ask spreads for issue premium or redemption discounts on the NAV calculated on the basis of set percentages, the capitalisation and amortisation of such costs over different time periods or, indeed, not taking into account such costs at all in the calculation of the vehicle NAV. Since the INREV NAV is primarily intended to facilitate comparability between different vehicles, the INREV approach is a simple but fixed methodology. Please note that these capitalised costs are subject to an impairment test each time the NAV is calculated and therefore should always be recoverable over time. As the adjustments with respect to set-up costs are separately disclosed in the calculation of a vehicle’s INREV NAV, investors can choose how these are taken into account when valuing their holding. Under IFRS, vehicle set-up costs are charged immediately to income after the inception of a vehicle. Such costs should be capitalised and amortised over the first five years of the term of the vehicle. The rationale for capitalising and amortising set-up costs is to better reflect the duration of the economic benefits to the vehicle. When capitalising and amortising set-up costs, a possible impairment test should be taken into account every time the adjusted NAV is calculated when market circumstances change and it is not expected that the capitalised set-up costs can be recovered through the sale of units of a vehicle. For instance, when a decision is made to liquidate the vehicle or stakeholders no longer expect to recover the economic benefit of such capitalised expenses, they should be written down. Under the fair value model, acquisition expenses of an investment property are effectively charged to income when fair value is calculated at the first subsequent measurement date after acquisition. This results in the fair value of a property on subsequent fair value measurement being lower than the total purchase price of the property, all other things being equal. Property acquisition expenses should be capitalised and amortised over the first five years after acquisition of the property. The rationale for capitalising and amortising acquisition expenses is to better reflect the duration of the economic benefits to the vehicle of these costs. When capitalising and amortising acquisition costs, a possible impairment test should be taken into account every time the adjusted NAV is calculated when market circumstances change and it is not expected that the capitalised acquisition costs can be recovered through the sale of units of a vehicle. When a property is sold during the amortisation period or is classified as held for sale, the balance of capitalised acquisition expenses of that property should be expensed. A liability represents a present obligation as a result of past events. A fee payable at the end of the life of a vehicle or at any other time during the life of a vehicle may not meet the criteria for recognition as a provision or liability in accordance with IFRS at reporting date. A description of the calculation methodology and the terms of the underlying agreement should be disclosed (or reference could be made to the related party disclosures in which such agreements and terms are explained). Transfer taxes and purchaser’s costs which would be incurred by the purchaser when acquiring a property are generally deducted when determining the fair value of investment properties under IAS 40. The effect of an intended sale of shares in a property-owning vehicle, rather than the property itself, should be taken into account when determining the amount of the deduction of transfer taxes and purchaser’s costs, to the extent this saving is expected to accrue to the seller when the property is sold. Disclosure should be made on how the estimate of the amount the manager expects to benefit from intended disposal strategies has been made. Reference should be made to both the current structure and prevailing market conditions. The adjustment represents the impact on the NAV of the difference between the amount determined in accordance with IFRS and the estimate of deferred tax which takes into account the expected manner of settlement (i.e., when tax structures and the intended method of disposals or settlement of assets and liabilities have been applied to reduce the actual tax liability). Disclosures should include an overview of the tax structure including, for instance, details of the property ownership structure, key assumptions and broad parameters used for estimating deferred taxes for each country, the maximum deferred tax amount estimated assuming only asset sales (i.e., without taking into account the intended method of disposal) and the approximate tax rates used. It is possible that the estimate of the amount of the adjustment required to bring the deferred tax liability related to property disposals to fair value could have a large impact on the INREV NAV. Since tax structures may differ from vehicle to vehicle, significant judgement is required and the mechanics of the calculation methodology for this adjustment may vary from vehicle to vehicle. Other components of the overall deferred tax adjustment require less judgement and are more mechanical in nature. This adjustment should include a full assessment of the tax impact on NAV of INREV NAV adjustments. As with IFRS, deferred tax balances are not discounted to take into account time value of money. The NAV of a consolidated group under IFRS may include the net liability position of subsidiary undertakings. In practice, however, the group may have neither a legal nor a constructive obligation to fund the accumulated losses in situations where the financing of the subsidiaries is non-recourse to the vehicle. In this scenario it is appropriate to make an adjustment when calculating the INREV NAV in order to recognise the group’s interest in such subsidiaries at nil or an adjusted negative amount rather than at a full net liability position, to the extent there is no intention or obligation on the vehicle to make good those losses. At acquisition of an entity which is determined to be a business combination, goodwill may arise as a result of a purchase price allocation exercise. Often a major component of such goodwill in property vehicles reflects the difference between the full recognition of deferred tax, purchaser’s costs or similar items in the IFRS accounts (which does not generally take account of the likely or intended method of subsequent exit), and the economic value attributed to such items in the actual purchase price. Except where such components of goodwill have already been written off in the NAV as determined under IFRS, they should be written off in the INREV NAV. The INREV NAV represents the economic value of the total investment by the investors as a group. To derive the NAV per unit, managers should take into consideration any rights (such as carried interest, performance fees, manager remuneration schemes, terms or different classes of units, NAV waterfall calculation, option shares etc.) held by equity shareholders, or prospective equity stakeholders (in the case of options) of the vehicle in allocating the overall INREV NAV of the vehicle to individual classes of equity shareholders and in determining the individual value of units or shares. In some circumstances, where the vehicle has raised and called capital, some investors may not have fully paid in their contributions. The INREV NAV per share should take into account the impact of called but unpaid capital. acquisition expenses - Description of the reasons for departure from the five year amortisation period if applicable. Note: the example does not include all required disclosures. The investment property is valued at fair value under the fair value option of IAS 40. The current fair value of the property based on an independent valuation report is 4,500. The vehicle is structured as far as possible as a tax neutral structure. All investment properties are held by special purpose vehicles (SPVs). Management’s strategy is to sell all properties through the sale of the shares in the relevant SPVs. It is estimated that this method will save the potential purchaser approximately 200 of transfer taxes. Investment property under construction is composed of a self-constructed or developed investment property valued at cost until construction or development is complete. The current fair value of the property under construction based on an independent valuation report is 400. Property classified as inventory is measured at the lower of cost or net realisable value. Currently, such inventory is carried at cost in the balance sheet. The current fair value of the property held for sale based on an independent valuation report and including a provision for disposal costs is 300. Property that is leased to tenants under a finance lease is initially measured at the initial net investment and subsequently re-measured based on an amortisation pattern reflecting a constant rate of return. Key assumptions include: Lease contract rent: 6%. Current rent: 7%. The current fair value of the finance lease based on current market interest rate conditions is 125. The deferred tax asset is measured in the financial statements at the nominal statutory tax rate. The nominal tax rate is 25%. This deferred tax asset relates to the revaluation of the derivative financial instruments. Management’s opinion is that a tax rate of 12.5% should be used to reflect the fair value of the deferred tax position concerning the derivative financial instruments. The vehicle is in the process of selling a property located in Euroland. The property has been reclassified as investment property held for sale and is measured at fair value in accordance with IAS 40 which does not include disposal costs of 30. The vehicle capital structure does not include any options, convertibles and other equity interests other than shareholder loans (see below). In addition to the performance fee arrangement included as a contractual liability, the manager of the vehicle, shareholder A, has a preferred right to an additional 10% of the profit of the year when an IRR hurdle rate is reached. The hurdle rate was reached for the first time in 2013. The profit for 2013 amounts to 100. The deferred tax liability is measured in the financial statements at the nominal statutory tax rate. The nominal tax rate is 25%. This deferred tax liability relates to the revaluation of the investment property. The vehicle is structured as a tax neutral structure. All investment properties are held by special purpose vehicles (SPVs). Management’s strategy is to sell all properties through the sale of the shares in the relevant SPVs. It is currently estimated that the sale will not lead to any payments to tax authorities but the deferred tax liability will be settled between the seller and the purchaser. Current market practice for this settlement is estimated to be 50% of the nominal rate. Debt is initially recognised at fair value net of transaction costs and subsequently measured at amortised cost using the effective interest rate method. Key assumptions include: Debt interest 5%. Current interest 5.25%. The current fair value of the fixed rate debt is estimated to be 2,850. The financial statements under IFRS show shareholder loans of 2,275. The shareholder loans are judged to form part of the long term interest of the vehicle’s shareholders. Under the vehicle’s constitution, a component of income in a period is contractually required to be paid out to shareholders. Consequently, other liabilities include undistributed dividends of 30. Set-up costs are expensed immediately at the inception of the vehicle. The total amount of set-up costs is 100. The vehicle was incorporated in 2010. It is assumed that set-up costs are not deductible. Under the fair value model, acquisition expenses of an investment property are charged to income as a component of fair value changes at the first subsequent measurement date after acquisition. We have assumed that the acquisition costs are incurred on 1 January each year. Under the other liabilities an obligation is recorded in relation to the fair value of potential performance fees for an amount of 10. The vehicle holds a 100% interest in a subsidiary which is in a position of negative equity. The vehicle currently has no intention or constructive obligation to fund the losses. The current accumulated negative equity (including shareholder loans) included in the consolidated accounts relating to this subsidiary is 100. The adjustment represents the impact on the NAV of the measurement of the self-constructed or developed investment properties to fair value. In the financial statements, properties that are leased to tenants under a finance lease are initially measured at the net investment and subsequently based on a pattern reflecting a constant rate of return. The adjustment represents the impact on the NAV of the measurement of such finance leases to fair value. The adjustment represents the impact on the NAV of the measurement of the properties intended for sale recorded using the lower of cost or net realisable value model to fair value less disposal costs. In the financial statements, debt is initially measured at fair value net of transaction costs and, generally, subsequently measured at amortised cost using the effective interest method. The adjustment represents the impact on NAV of the measurement of all debt and related derivatives to their fair values. In 2010, an amount of 100 of vehicle set-up costs was expensed immediately to the income statement prepared under IFRS. In accordance with INREV Guidelines, these vehicle set-up costs have been capitalised and amortised over the first five years of the life of the vehicle. During the year 2013, the vehicle amortised an amount of 20, resulting in a cumulative amortisation of 80. The manager assesses that no impairment should be recorded as it is not to be expected that the capitalised set-up costs can be recovered through the sale of the units of the vehicle. From 2010 to 2013, acquisition expenses amounting to 210 were expensed immediately to the income statement prepared under IFRS. In accordance with INREV Guidelines, these acquisition expenses have been capitalised and amortised over the first five years after the acquisition of the buildings. During the year 2013, the vehicle amortised an amount of 42, resulting in a cumulative amortisation of 106. The unamortised amount at 2013 is 104. The manager assesses that no impairment should be recorded as it is not to be expected that the acquisition expenses can be recovered through the sale of the units of the vehicle. The deferred tax assets and liabilities are measured in the financial statements at the nominal statutory tax rate. The manner in which the vehicle expects to settle deferred tax is not taken into consideration. The adjustment represents the impact on the NAV of the deferred tax for the assets and liabilities of the vehicle (in this case properties and derivative financial instruments) based on the expected manner of settlement (i.e., when tax structures have been applied to reduce tax on capital gains or allowances, this should be taken into consideration). Management’s opinion is that a tax rate of 12.5% should be used to reflect the fair value of the deferred tax position concerning debts and related derivative financial instruments. For the adjusted NAV calculation all potential other deferred taxes are valued at 50% of the nominal rate. The difference between the fair value of properties leased to tenants under a finance lease and the corresponding tax book value is expected to reverse as an effective rate of 12.5%, taking into account the vehicle tax structure and likely exit scenario. The existing deferred tax measured at fair value is calculated by multiplying the difference between the deferred tax asset and deferred tax liability by 50%. The vehicle holds a 100% interest in a subsidiary which is in a position of negative equity. The vehicle currently holds no intention or constructive obligation to fund the losses. The current accumulated negative equity (including shareholder loans) position is 100. An adjustment of 100 is therefore made to the INREV NAV. The NAV per share is calculated based on the INREV NAV adjusted for any preferences due to shareholders based on the current equity structure. Initially, profit allocation to preferred shareholders is calculated, and then the remaining INREV NAV is allocated according to the current equity structure. What is the rationale behind the adjustments in determining the INREV NAV whereby set-up costs and acquisition expenses are capitalised and amortised over five years? Do these adjustments not simply inflate the NAV of the entity given that the property portfolio is already included at its fair value in the NAV calculation? The initial main aim of the INREV NAV is to help compare vehicle performance across a peer group and for the valuation of the investment in the units for accounting purposes at the investor level. 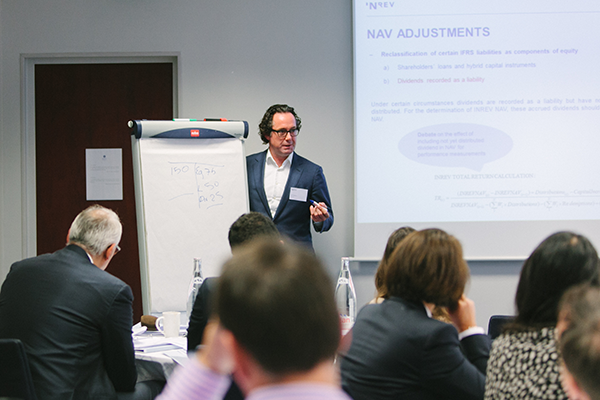 During the initial INREV NAV project in 2007 it was decided after several workshops, interviews and the white paper process to have one INREV NAV for both open end and closed end vehicles, with the intention of increasing comparability. It was noted that for some adjustments the suggested treatment would not necessarily lead to the correct approach for certain types of vehicle. However, when measuring performance of different types of vehicle (such as in the INREV INDEX), comparability would be increased if all vehicles treated adjustments in the same way. The initial rationale for capitalising and amortising set-up/acquisition expenses is to better reflect the duration of economic benefit to the vehicle of these costs. This is for both performance measurement and valuation of investments. This was prompted by the fact that, under IFRS, set-up costs are charged immediately to income after the start/inception of a vehicle and under the fair value model, acquisition expenses of investment property are effectively charged to income when fair value is calculated at the first subsequent measurement date after acquisition – resulting in the so-called J-curve. Based on the outcome of the analyses in 2007 it was INREV’s intention to use an adjusted NAV for performance measurement (including in the INREV Index) to mitigate the negative effects of the J-curve. If for performance measurement different types of vehicle, with different vintages, are compared in one index the treatment of set-up costs and acquisition expenses as a one-off expense would lead to an underperformance of that specific vehicle, in comparison with its point of reference, in the first years of the life of the vehicle (acquisition phase). For the years up to the disposal phase it would more easily outperform the point of reference, as the effects of the J-curve arising on new vehicles would lower the overall performance point of reference. During the disposal phase, a vehicle would generally underperform the point of reference as the one-off effects of the disposal costs would have a negative effect on the individual performance of the vehicle. With the amortisation of set-up costs and property acquisition expenses the effect of the so-called “J-curve” can be eliminated in the valuation of units in investment vehicles. Some investors were using an adjusted NAV for valuation, others, at that time, were recording the investments at cost for the first three years and only starting to use IFRS NAV when the appreciation of real estate values had driven IFRS NAV above the initial cost price. Furthermore, it was noted that investors were of the opinion that such expenses have a value, and were seen as part of the initial investment. These costs were directly incurred in order to receive direct returns from the rental income and hopefully indirect returns by way of value appreciation upon liquidation. This return would flow back to the investor during the whole holding period of an investment. As described in module 4 of the INREV guidelines, INREV’s objective in establishing these guidelines is to provide managers with guidance on how to calculate and disclose an INREV NAV in financial reports of non-listed European real estate vehicles. This should lead to transparency and comparability of the performance of different types of vehicles. One of the purposes of reporting is to present investors with information relevant to the performance and valuation of their investment. The NAV derived from generally accepted accounting principles (GAAP), including IFRS, does not necessarily fulfil this objective. The INREV guidelines have therefore been prepared to provide an industry specific framework to enable managers to calculate a more meaningful adjusted NAV. For the sake of clarity, all of the adjustments presented in the guidelines are based on IFRS. However, IFRS also offer some options and INREV adjustments may differ based on the selected option (i.e: cost versus fair value). Consequently, the guidelines are describing all the adjustments which should be done in order to compute an INREV NAV. Taking this into consideration, it is not mandatory to first calculate an IFRS NAV, adjustments can be applied directly to the chosen GAAP as long as the fund manager clearly understands the purpose of the adjustments and amends the adjustments accordingly. If the adjustments are performed correctly, the INREV NAV should be the same whatever the initial starting point GAAP was. 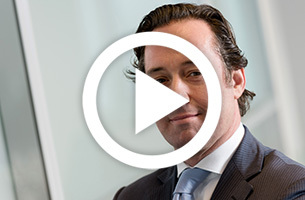 How can fund managers and investors access their own materiality and disclose this? Calculating INREV NAV, the question might arise if a certain suggested INREV NAV adjustment would have a material impact on the total INREV NAV. The reason might be that a fund manager has to take some effort to collect, assess, calculate and evaluate all data and information that is needed to come to a correct INREV NAV Adjustment with sufficient disclosure. Expecting only immaterial effects and considering the cost-benefit-ratio fund managers might want to decide not to include a certain adjustment. INREV does not feel to be in the position to determine an accepted amount or % of materiality for INREV NAV Adjustments since materiality level could be different for each vehicle, fund manager, investor or other user of the INREV NAV (for example indices). Guidance on Materiality can be found in the International Standard on Auditing (ISA) 320: Materiality in Planning and Performing an Audit. Judgments about matters that are material to users of the financial statements are based on a consideration of the common financial information needs of users as a group. The possible effect of misstatements on specific individual users, whose needs may vary widely, is not considered. Determining materiality involves the exercise of professional judgment. A percentage is often applied to a chosen point of reference as a starting point in determining materiality for the financial statements/INREV NAV as a whole. In the case of a regulated vehicle, the determination of materiality for the financial statements/adjusted NAV, INREV NAV as a whole (and, if applicable, materiality level or levels for particular classes of transactions, account balances, INREV NAV adjustments or disclosures) is/might therefore be influenced by law, regulation or other authority. Based on circumstances a fund manager could assess if there is a need for a materiality. The materiality could be used to decide not to include certain adjustments. Since assessing materiality levels might be a complex exercise, INREV recommends to request the auditor of the vehicle what the specific materiality is that he is using for the audit of the financial statements as a whole. Further guidance on determining materiality can be found on the website of www.ifac.org. If the fund manager decided not to include an adjustment, since he expects that leaving out that adjustment should not have a material effect on the INREV NAV in total, proper disclose should be provided. The Balance sheet and Profit and Loss account of VERNI Real Estate S.A. are prepared according to IFRS accounting principles. The tax expense for the period comprises current and deferred tax. Tax is recognised in the income statement, except to the extent that it relates to items recognised directly in other comprehensive income or equity - in which case, the tax is also recognised in other comprehensive income or equity. The current income tax charge is calculated on the basis of the tax laws enacted or substantively enacted at the date of the statement of financial position in the countries where the Group operates. Management periodically evaluates positions taken in tax returns with respect to situations in which applicable tax regulation is subject to interpretation, and establishes provisions where appropriate on the basis of amounts expected to be paid to the tax authorities. Deferred income tax is provided in full, using the liability method, on temporary differences arising between the tax bases of assets and liabilities and their carrying amounts in the consolidated financial statements. However, deferred income tax is not accounted for if it arises from initial recognition of an asset or liability in a transaction other than a business combination that at the time of the transaction affects neither accounting nor taxable profit or loss. Deferred income tax is determined using tax rates (and laws) that have been enacted or substantially enacted by the date of the statement of financial position and are expected to apply when the related deferred income tax asset is realised or the deferred income tax liability is settled. The carrying value of the Group’s investment property is assumed to be realised by sale at the end of use. The capital gains tax rate applied is that which would apply on a direct sale of the property recorded in the consolidated statement of financial position regardless of whether the Group would structure the sale via the disposal of the subsidiary holding the asset, to which a different tax rate may apply. The deferred tax is then calculated based on the respective temporary differences and tax consequences arising from recovery through sale. No deferred tax liability should then be recognised because of the initial recognition exemption rule. Revaluation to fair value of deferred taxes and tax effect of INREV NAV adjustments Under IFRS, deferred tax assets and liabilities are measured at the nominal statutory tax rate. The manner in which the vehicle expects to realise deferred tax (for example, for investment properties through share sales rather than direct property sales) is generally not taken into consideration. A fund is structured that it has 6 properties in different countries. These are held via 4 SPV's. How should this adjustment be calculated? Is it appropriate to calculate this as a fixed percentage (e.g., 50%) of the deferred tax liability calculated for the vehicle under IFRS/local GAAP on a portfolio basis or any other aggregate basis? The rationale behind this adjustment is that under IFRS (and many other GAAPs) deferred tax liabilities are measured at the nominal statutory tax rate. The manner in which a vehicle expects to settle deferred tax is generally not taken into consideration. Accordingly, the provision calculated on this basis may not be representative of the fair value of deferred tax liabilities (i.e., the actual amounts expected to be crystallised upon disposal of the property assets). In calculating the adjustment of the fair value of the liability, based on the expected manner of settlement, the adjustment should be assessed on an asset-by-asset basis. For each asset, therefore, consideration should be given as to the most likely form of disposal (e.g., asset deal or share deal) based on the intended disposal method and tax structuring of the asset as well as market conditions relevant to that property as at the date of calculation. Assumption of changes in disposal method based on as-yet unrealised future changes in market conditions are considered too subjective for the purposes of calculating the INREV NAV adjustments. If applicable, the history of the entity with regard to disposals should also be considered. The fair value of the deferred tax liability is then calculated in accordance with the assessed manner of settlement as well as the applicable rates at which the transaction would be taxed. IFRS allows only the rates that have been enacted or substantially enacted at the balance sheet date to be used whereas rates which have been enacted or substantially enacted after the balance sheet date can be used for the purposes of calculating the INREV NAV adjustment. The calculation should also take into account any discounts to the sale price of a property sold via a share deal that are likely to be granted. For example, it may be that the sale of the shares of the property-owning entity is exempt from tax (or attracts minimal tax) but a deduction in respect of the latent capital gain within the property owning entity is made in arriving at the sale price. This amount in addition to any tax likely to crystallise on the disposal transaction should be taken into account when calculating the INREV NAV adjustment. On this basis, therefore, a fixed percentage approach as outlined above will not be appropriate unless it represents a reasonable estimate of the adjustment required in respect of the deferred tax liability for each of the individual properties in the portfolio. It is imperative to ensure that the calculation of the adjustment, either in part or in full, is not already included within the deferred tax liability calculated for the vehicle under IFRS/local GAAP, so as to avoid double-counting of the adjustment. Care should also be taken to ensure that there is no double-counting between this adjustment and the INREV adjustment on transfer taxes with regard to the valuation of property. For avoidance of doubt, transfer taxes should not be included within the scope of the deferred taxation adjustment calculation. Given the subjective and complex nature of this calculation, therefore, it is recommended that managers document a formal internal policy with regard to the calculation methodology and review the policy on an ongoing basis (for example, with respect to changes in tax law and market conditions) in order to ensure that it remains appropriate. Disclosure should be given on the overall tax structure, including the overall ownership structure, key assumptions and broad parameters for each country, what the maximum taxation calculation would be on a traditional basis (i.e., without tax structures) and the approximate tax rate as a percentage. How should this adjustment be calculated? Is it appropriate to compute this as a fixed percentage (e.g., 50%) of the transfer taxes for the vehicle under IFRS/local GAAP? The calculation of the adjustment to the deduction of transfer tax (and other purchaser’s costs) inherent in the property valuation based on the expected manner of settlement, should be assessed on an asset-by-asset basis. For each asset, therefore, consideration should be given as to the most likely form of disposal (e.g., asset deal or share deal) based on the intended disposal method and tax structuring of the asset as well as market conditions relevant to that property. If applicable, the history of the entity with regard to disposals and the agreed allocation of the tax burden between the seller and the purchaser should also be considered. This is the same rationale as for the calculation of the deferred tax liability adjustment. Where the assessed disposal method would result in a reduction in the transfer taxes (and purchaser’s costs) in the fair valuation of the property, this adjustment is made in arriving at the INREV NAV. However, the adjustment should only be included to the extent to which it is not already included in the property valuation, in order to avoid double-counting. For this reason it is important that transfer taxes and other purchaser’s costs are considered as separate components when computing the adjustment. The same reduction may not be appropriate in both cases. For example, a share deal disposal may result in lower transfer taxes but may, in fact, increase the other purchaser’s costs due to the need for additional legal expenditure and diligence required to complete any such deal. On this basis, therefore, a fixed percentage approach as outlined above will not be appropriate unless it represents a reasonable estimate of the adjustment required for both transfer taxes and other purchaser’s costs for each of the individual properties in the portfolio. Given the subjective and complex nature of this calculation, therefore, it is recommended that managers document a formal internal policy with regard to the calculation methodology and review the policy on an ongoing basis (for example, with respect to changes in tax law and market conditions) in order to ensure that it remains appropriate. Adequate disclosures should also be provided so that users of the financial information can understand the calculation methodology with regard to the adjustment, as well as the key assumptions that the manager has made in the calculation and how the manager expects to utilise this additional value based on the current structure and market circumstances. How should the INREV Guidelines be applied when valuing an entity’s investment in an associate/joint venture which is accounted for in the IFRS/local GAAP accounts of the entity (using either the equity method or proportionate consolidation)? 4. If there is not sufficient information available to compute the INREV NAV of the investment then another valuation technique should be used including, for example, an estimate based on recent comparable transactions if these are available. Should the INREV NAV calculation include a portfolio premium/discount where, for example, the independent appraiser’s valuation report includes a statement that the portfolio as a whole would command a premium/discount in addition/decrease to/of the individually appraised values of each property? The portfolio premium/discount should not be included in the INREV adjusted NAV and, according to the INREV Guidelines for property valuation, should not be included within the fair value of property. Nevertheless it is recommended that any such premium or discount be disclosed separately. Is it not the case that, for open end vehicles, there is no need for fair valuations for hedging derivatives on the basis that upon maturity the value of these should be nil? For both closed end and open end vehicles, the diluted INREV NAV should reflect all hedging derivatives at their fair value. We will update you as soon as we have new plans for the INREV NAV Guidelines. The checklist allows to evaluate the level of compliance with the INREV NAV requirements of the Guidelines.